We are delighted to announce that nmcn received the ‘Best Main Contractor to Work with (Over £250m)’ award at last night’s Construction Enquirer Awards 2018. 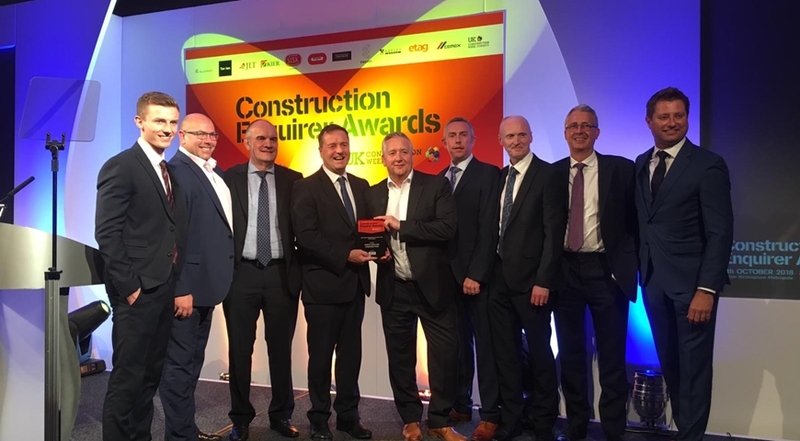 We are delighted to announce that nmcn (NM Group at the time of award) received the ‘Best Main Contractor to Work with (Over £250m)’ award at last night’s Construction Enquirer Awards 2018. Winners at the prestigious award ceremony, dedicated to recognising and rewarding the industry’s best companies to work for and the best firms to do business with, were voted for over a number of weeks by Enquirer readers. More than 18,000 votes were cast by readers for their favourite companies and projects. nmcn would like to extend a huge thanks to all those who voted for us which culminated in us being awarded this significant accolade. The awards are the highlight of UK Construction Week which is currently underway at Birmingham’s NEC.